A sampling of some artistic endeavors including plays and comic strips that credit, portray, or otherwise make reference to John Mack. 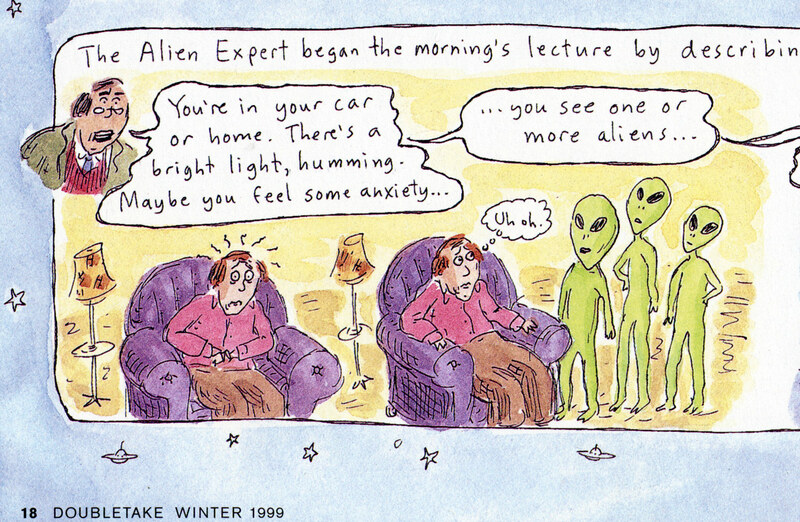 Roz Chast is an award-winning cartoonist and illustrator whose work has appeared in The New Yorker and other magazines from the late 1970s onwards. Though best known for her one-panel bits, Chast devoted a four-page full-color spread to her portrayal of Dr John Mack and the assorted guests and audience members who attended Mack’s “Star Wisdom conference” (held in Newtonville, MA) in 1999. (We can only present a small excerpt here due to copyright restrictions). 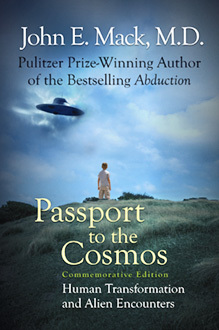 Though no one is explicitly named, you can recognize Dr Mack, Brazilian Shaman Bernardo Peixoto, Sequoyah Trueblood (“resembles Johnny Cash,” Chast notes), one of the “experiencers” from John Mack’s book Passport to the Cosmos, Dr Edgar Mitchell (still wearing his silver space suit in Chast’s vision), and others. Aliens, Ahoy! first ran in DoubleTake (an art magazine associated with Duke University), in the Winter 1999 issue. It was later reprinted in one of Chast’s books of collected works, Theories of Everything: Selected, Collected, Health-Inspected Cartoons by Roz Chast 1978-2006 (2008, Bloomsbury USA, ISBN: 9781596915404). Full-size image not available due to copyright restrictions; buy the book Theories of Everything. to reach a higher level of consciousness. (the galaxy’s) most extraordinary lover. The creator of the popular syndicated cartoon strip “Sylvia” explores the devilishly quirky personality traits of pet cats. “The Girl Who Was Raised By Cats” was originally presented in the book: Everything Here Is Mine: An Unhelpful Guide to Cat Behavior (Avon Books, 2000). 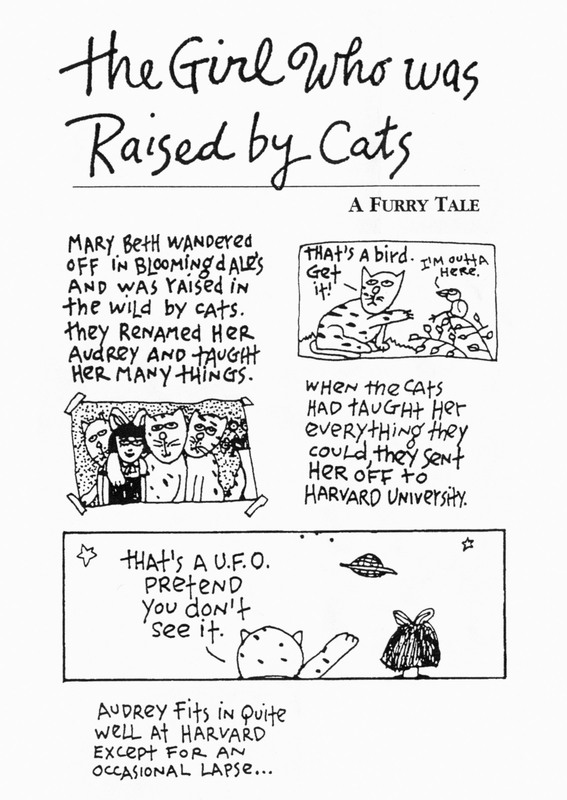 Later reprinted in the book Cats With Attitude (Gramercy, 2002). 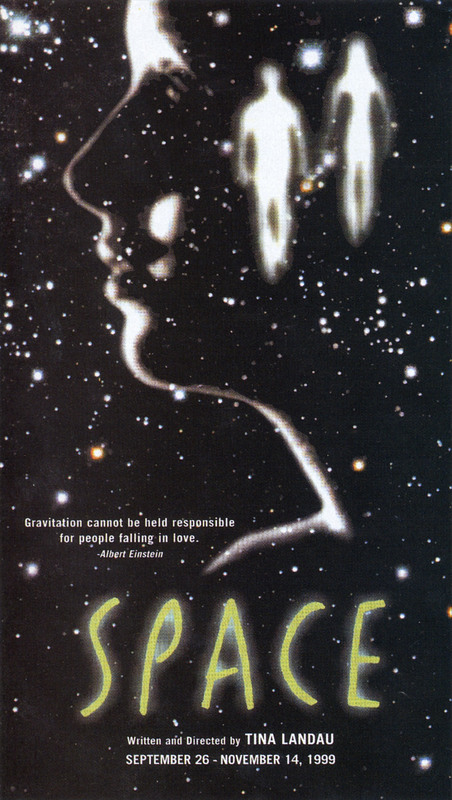 The lead character of Dr. Allan Saunders is not based exclusively on Dr. John Mack; the theatre booklet notes that Space was inspired by and draws on the writings of a range of thinkers including Gaston Bachelard, L. Frank Baum, Hal Boyle, George Bradley, Joseph Campbell, Lewis Carroll, Arthur C. Clarke, Dante, Rene Daumal, Charles Dickens, Albert Einstein, Gail Goodwin, Timothy Ferris, Richard Feynman, Krishnamurti, John E. Mack, Portia Nelson, Chet Raymo, Carl Sagan, Jill Tarter, John Wooden, and others. In the 1992 television movie Intruders, the character of psychiatrist “Dr. Neil Chase” (played by actor Richard Crenna) is a composite of researcher Budd Hopkins and Dr. Mack; Crenna visited with Mack in preparation for the role. Hopkins’ book Intruders inspired the teleplay. Tormé also visited experiencers at Dr. Mack’s organization in April 1991, and actress Daphene Ashbrook consulted with some as well. Note: This play, staged in 2000, does not include a depiction of Dr. Mack, but we mention it because directors Gilman and Tanzer interviewed experiencers associated with his organization as part of their research process. Set against the backdrop of 1950’s American suburbia and the “ideal” nuclear family, The Abduction Project explores the nature of domesticity (and its effects on the brain; the semi-permeable line between dream and reality; and the complex (and little understood) nature of memory. With this project, Collision Theory leaps beyond the familiar, the tangible, and the scientifically observable into the surreal landscapes of outer space, hyper-space and the vast inner spaces that comprise the human mind. The production takes place in the 1950’s, when Americans were worrying about Roswell and the threat of nuclear war loomed over the country. 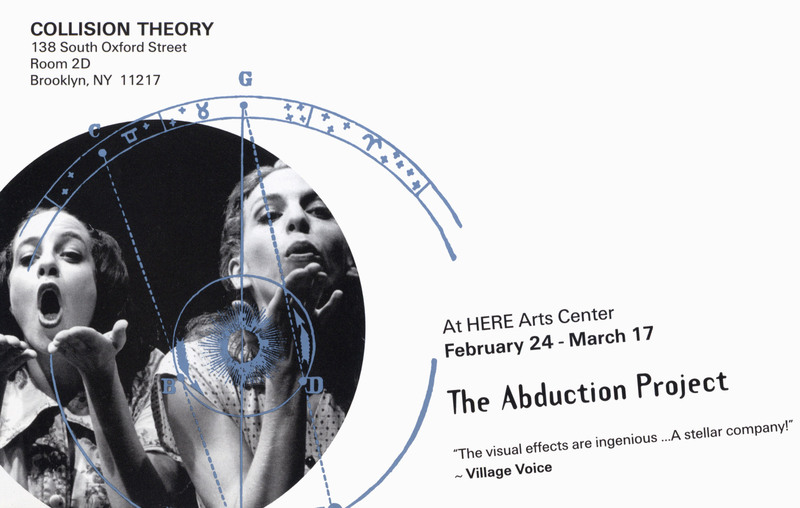 Conceived and directed by Stephanie Gilman and Tanzer, the theatrical work probes the mysteries of alien abductions as well as domesticity and violence. Collision Theory is an award-winning ensemble theater company that creates and produces innovative, adventurous physical theater using the company’s own highly developed choreographic style. A close encounter in Brazil inspired playwright Doug Banasky to write “My Favorite Alien,” a comedy about alien abduction and the end of the world at the millennium, premiering Friday at Broom Street Theater. Last summer, Banasky, who has a master’s degree in social work from UW-Madison and has spent seven years as a hospice and social worker, traveled to Brazil to attend a conference sponsored by the International Transpersonal Association. He got to know Mack when they both joined a post-conference expedition to visit an ecological community in the Brazilian rain forest. 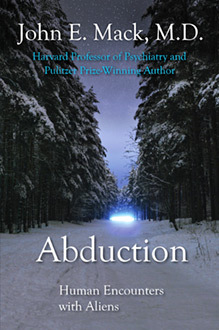 Mack’s book tried to legitimize and recognize the experiences of people who claim to have been abducted by aliens, says Banasky. The “evidence” for these abductions is, however, all internal, assuming form as memories and post-traumatic stress. Mack won a Pulitzer Prize in 1977 for his biography of T.E. Lawrence, but “this work he’s doing now has earned him scorn and ridicule,” says Banasky. “I’m intrigued by the connection between abductions and the belief in an impending environmental crisis,” says Banasky, who recently moved back to Madison from Seattle specifically to do work at Broom Street. The play shows at 8 p.m. Fridays-Sundays through Feb. 16 at Broom Street Theater, 1119 Williamson St. Tickets are $7 at the door.